The project structure of COHERENT by work package (WP) is shown below. WP1 is responsible for project administration and management. WP2 is dedicated to the use case and scenario definition, system architecture design, and on the development of the COHERENT software development kit (SDK). WP3 is concentrated on the modelling, abstraction and control of physical and MAC layer of underlying heterogeneous mobile networks. WP4 will study the flexible spectrum management for inter- and intra- operator spectrum sharing and flexible duplexing in downlink and uplink of cells. WP5 will tackle the challenges of Consistency Availability and Partition (CAP) theorem in programmable radio access networks (RAN), and joint radio and backhaul resource allocation in large possibly virtualized radio access networks. 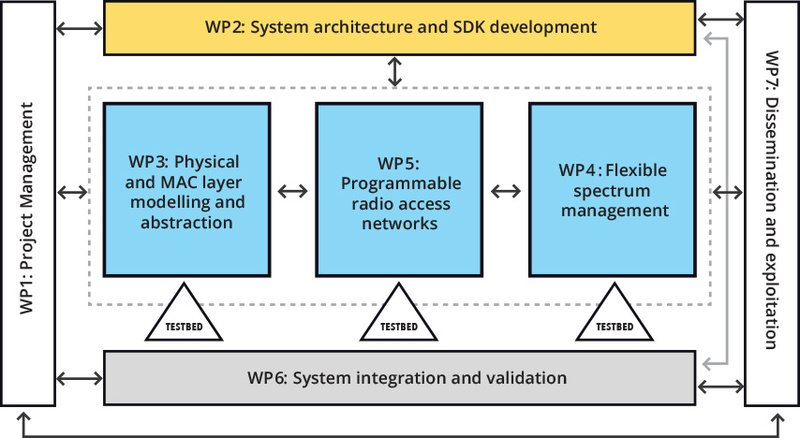 WP6 will build four testbeds to demonstrate and verify the proposed control architecture and algorithms, which plays an important role in the dissemination of the project results. WP7 deals with dissemination, standardization, and exploitation of the project results.